Dear all, finally the Autumn season has come over to us officially! With the cool Autumn breeze, the biggest highlight in Autumn will be fall foliage. 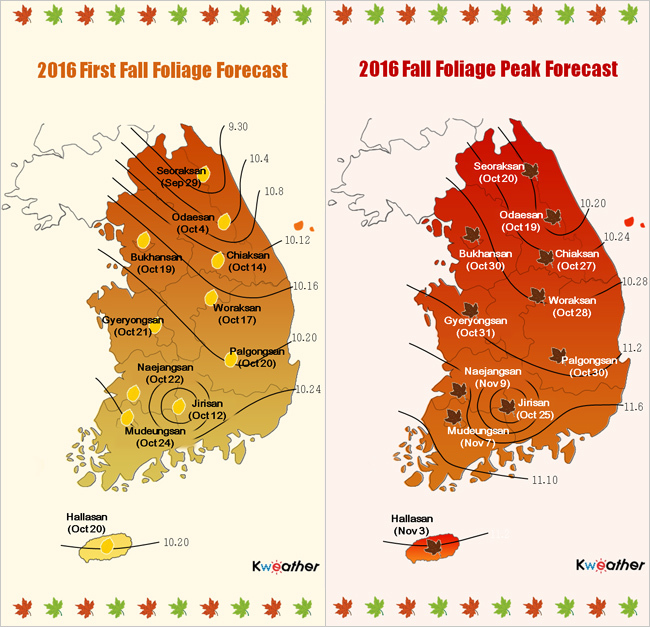 Fall foliage in Korea starts from the coldest place, so Gangwon located in northern and east part of Korea always welcomes this great nature’s change in a first place. Mt. Seorak is the very first place you can see the fall foliage. There is a saying, “You cannot but fall in love with Mt. Seorak that embraces human beings.”Mt. Seorak is also called ‘incomparable beauty’, and shape of towering mountains and rocks and emerald-colored water flowing through falls and valleys create such magnificent scene. Grace Travel has a direct ride from Seoul to Mt. Seorak. From Seoul Express Bus Terminal or Dong Seoul Bus Terminal, take a bus to Sokcho (Travel time: approx. 2hr 30min). – From Sokcho Express / Intercity Bus Terminal, take Bus No. 7 or 7-1. – Get off at Sogongwon Bus Stop (Travel time: approx. 45 min). 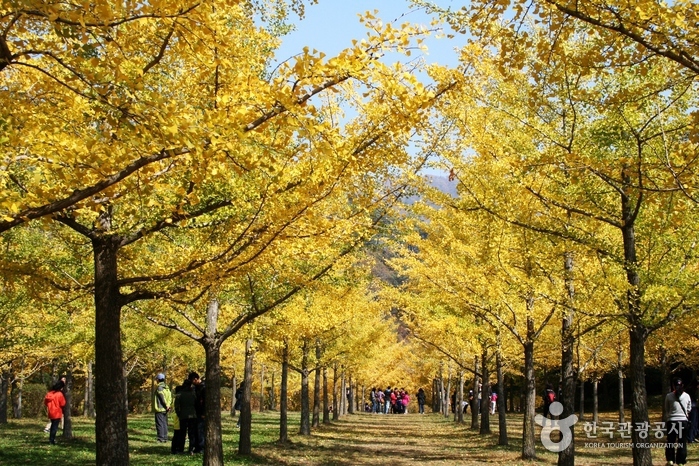 Hongcheon ginkgo forest even featured in Miss flower series in Korea Tourism Organization opens in October only. IIts beautiful story is of a husband who planted a ginkgo tree for his ill wife to wish for her health since 1985 and is now grown into a majestic forest. 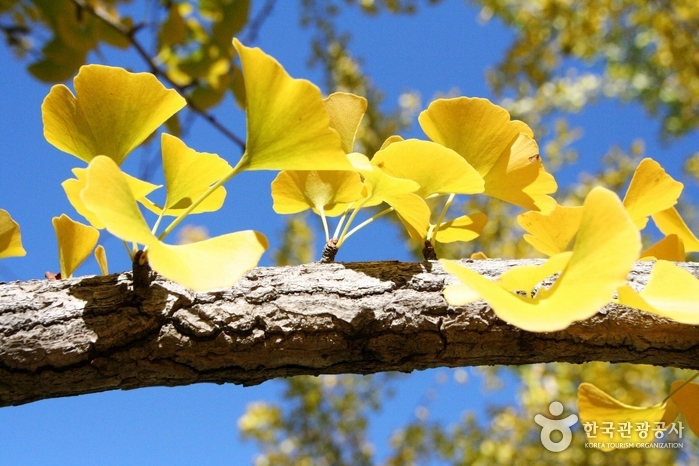 Come see the beautiful ginkgo tree garden and feel the great love. From Seoul Express Bus Terminal or Dong Seoul Bus Terminal, take a bus to Hongcheon (Travel time: approx. 1hr 30min). Walking by the Betula platyphylla trees and Narincheon valley feels like stepping into a fantasy world. The whispering sound and rustle of the leaves will let you know that you are in the midst of Korea’s beautiful autumn. From Seoul Express Bus Terminal or Dong Seoul Bus Terminal, take a bus to Inje (Travel time: approx. 1hr 30min). Nami Island is a small island on the outskirts of Chuncheon. It is a great place for taking a stroll with friends and loved ones, surrounded by art, culture, and the nature. In fall, autumn colors of maple trees and ginkgo trees are gorgeous, and you can enjoy the view on bikes or electric cars. Various cultural events take place on this island all around the year, like art exhibitions, photo exhibitions, children’s book exhibitions, book fair and concerts. Nami Island is a little island on the edges of Chuncheon. It is an awesome place for going for a walk with companions and friends and family, encompassed by workmanship, culture, and the nature. In fall, harvest time shades of maple trees and ginkgo trees are ravishing, and you can appreciate the view on bicycles or electric autos. Different social occasions happen on this island all around the year, similar to workmanship displays, photograph shows, kids’ book presentations, book reasonable and shows.